I spent some time looking for petals and came across these. I figured, why not? and ordered a set. Well with an estimated shipping of about a week out, they arrived the next day!!! I am not terribly far from where they shipped but I did not even expect to see them for at least 5 days! Extremely satisfied not only with the shipping, the service but also the product! Ordering more now! We used the freeze dried rose petals for after the ceremony. As the bride and groom recessed, the guests threw rose petals over them. We were able to package them a week ahead of time and you couldn't do that with fresh petals. The rose petals were the perfect shade of lavender and matched my flower girl's dress perfectly. She proudly tossed these on the ocean dock for our beach ocean wedding, the effect was beautiful. I ordered them three weeks prior and followed the directions and they were as fresh as the day I received them. These are so great and lifted all my worries With the prompt arrival. They do not disappoint. The rose petals came the day I requested. Each petal was pefect and beautiful. They were a wonderful addition to my tables and did not brown like a fresh petal would instantly! I am so glad I bought!!! This product was used on individual tables scattered about. These petals were colored as described and even came with detailed instructions on how to preserve or soften them - they were a beautiful addition to our wedding and more than filled the flower girl's basket! They were also delivered on time as promised, just days before the wedding! Excellent buy! Used for my sons wedding. The flower girl loved this. We put out the darker petals to show her where to start throwing petals (she is a 5 y/o) and she used the lighter colored petals to actually throw out. 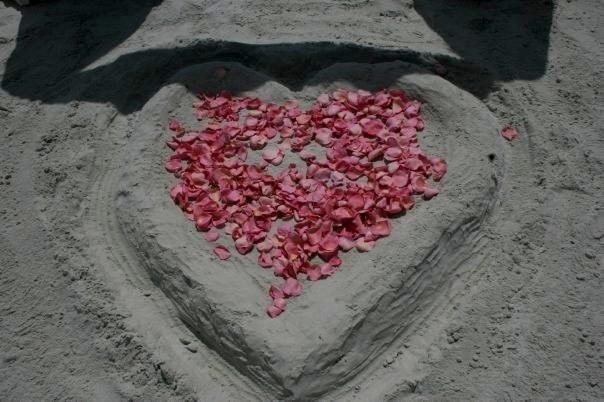 I use the petals in my beach wedding business. I do not allow silk petals as that would be littering. The product itself is no different than others of the same offered on the web. The prices on this site were the best for the amount that I found. Great for outdoor wedding, don't have to worry about clean up. Environmental friendly. I used the freeze dried flower petals as part of my centerpieces at my wedding reception. They worked perfectly, although I would have liked more red colors in the fall blend. Also, there weren't as many petals as I expected in the 60 cup package. Overall though, they worked out great! It was a perfect day! The freeze dried flowers worked perfectly. They were easy to travel with and when we got to the beach we just left them in the bathroom for a day and they blossomed into gorgeous rose petals. They were beautiful. Wish I had bought more though to better line the aisle. Good quality and smell great! I used these rose petals to decorate the wedding night for my friend, but I realized 10 cups was not enough. You will definitely need much more especially if you are trying to leave a trail on the ground. Let me just say that the flowers arrived packaged nicely and were absolutely beautiful. 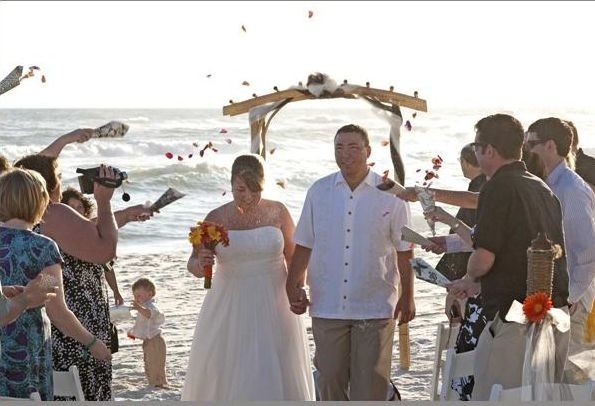 The tropical colors remained vibrant until the day my wedding coordinator sprinkled them on the beach. Transporting them to St.Lucia was easy in my carryon luggage. The price was easily affordable compared to getting them at the resort. Very happy and the pictures look beautiful. We did a black and white wedding, so we had black table cloths and put these pedals around the centerpieces. Perfect! These worked perfectly for my wedding. They were beautiful and looked like fresh rose petals.They were much nicer than I expected, the only Con I can think of is you really need to order a lot more than you think you will need. I ordered 20 cups thinking it would be a huge amount and was much smaller of and amount than expected. Used these instead of bubbles at the ceremony and they worked beautifully! The petals were perfect. They were shipped to us close to the event date for superior color. The petals made our wedding isile beautiful. For my outdoor wedding, I filled a basket with these Freeze dried rose petals for my flower girl to drop as she walked down the isle. She loved them so much! Since it was on outdoor wedding this was my way of making an isle to walk down. I loved these rose petals for my outdoor garden wedding! They smell and look fresh longer, keep their color longer, and they don't wither away for months and months!!! Beatiful, fresh looking til the end!! Our wedding was on a beach behind a 4 star hotel and there wasn't much we were allowed to do to decorate. The petals were a perfect alternative to rice or bubbles, and made for a beautiful aisleway! I would use them again! We ordered these after reading all the reviews, so I felt I estimated the volume correctly but still found ourselves short of the necessary amount of petals. The texture is better than fresh, and there was no wilting or fading AT ALL, so in that respect they were excellent. But unless you want to spend big bucks to use alot of them, I'd recommend them for special accents. We used them on the edges of the aisle and for the bed and tub in the honeymoon suite; we'd planned to use them to cover the aisle. I used the flowers for the isle, tables, and to throw. I really enjoyed my purchase. They were beautiful petals [...]. The only thing I didn't like was the price.I would recomend that a bride choose pedals to throw instead of seeds if that is what you are thinking. The pedals make better pictures and you also won't have to worry about someone trying to be funny and throw them really hard! We used a combination of both and I now wish we would have only chosen the pedals. Good luck w all the planning. We used these for a beach wedding in Hawaii. They were absolutely perfect! They looked and smelled like fresh petals but without the wilting! Petals were great! Excellent quality and color...quantity was WAYYY less than I had expected...definitely order 3 times as much as you need! Highly recommended. I used these rose petals as toss petals during our exit following the ceremony. The roses came in on time and were in excellant shape! I only had 4 months to plan my wedding so this was a huge time saver! If cared for properly the roses look great!! The only downfall was that they were pretty pricey- got fresh rose petals for my flower girl- alot more petals for a fraction of the cost. Wish I would have looked into that first! I used these freeze-dried petals for my flower girls, they worked perfectly!!! A lot cheaper than purchasing real ones, and they looked so real. I got to have the real look of rose petals for a cheaper cost and they could be thrown on the beach because they are eco friendly!!! I used these to line the aisles for our outdoor ceremony. They were very nice, but there weren't as many as I'd hoped. We supplemented with fresh petals, and you couldn't tell the difference between the two! Just what I expected and was hoping for. I used the freeze dried rose petals for tossing (flowergirl), to decorate my cake, and to scatter around our centerpieces on the table. They looked great and softened up well but we had very wet weather and lots of humidity so they got TOO moist towards the middle of the ceremony and basically became flat. They were beautiful though and had we not had 24 rainy days of the past 28 days I'm sure that wouldn't have been a problem. We used them for the cake and the cake table and the flower girl throw them out when she walked down the ilse. They were beautful, easy to take care of and exactly what I was looking for. After searching many websites I found these roses to be the best priced. I bought them to line the isle at our outdoor wedding. When they arrived, they were packaged well and smelled wonderful. They were fresh and the colors were vibrant. They looked beautiful at my wedding lining the isle and on the tables. Even my florist was impressed and said it was a good deal. I couldn't have been happier with these Rose Petals! I used these beautiful petals in an outdoor wedding. They were gorgeous, better than the photos. So much easier to use than fresh - no "bleeding" of color, no wilting, they stay perfetly until you are ready and are easily hydrated. One less thing to fret about! I would buy this product- again! Beautiful colors, great value and preserved in a sealed plastic bag. Care instructions included. Affordable yet a beautiful addition to create color and atmosphere. I loved the petals! They smelled great and looked beautiful. I planned to use the petals on my candy table; however, there were not nearly enough in the two packages that I purchased to use them. So I ended up using them on our "Bride and Groom" table. If you plan to purchase these...just make sure you buy 3 times more than what you would think you would need. Otherwise...I have no complaints. I used the rose petals on all tables to accent candles, mirrors, and the favor boxes. I absolutely loved the elegance that these petals added to our reception. I got several compliments on the rose petals and no one could believe that they were freeze dried... everyone thought they were fresh....so i got the look I wanted for a better price and with out all the hassel of fresh rose petals....I was very happy and feel that it was money well spent. Also the burgundy petals matched my burgundy candles perfectly. The rose petals were much better than real fresh petals. They looked gorgeous on our wedding tables. Customer service was excellent. A real person called me to make sure they would be delivered on the right date as these petals do loose freshness after a week or two. They are a littlebit pricy but a little does go a fairly long way. I used about 30 cups to decorate 9 tables. I highly highly recommend using these when decorating a party. The centerpieces were glass bowls filled with water and 3 rose heads with a candle in the center. The large round tables needed a little something extra and the rose petals were perfect. I didn't like the fake rose petals so it was important to have the real freeze dried petals. Extra petals were scattered at the base of the wedding cake. 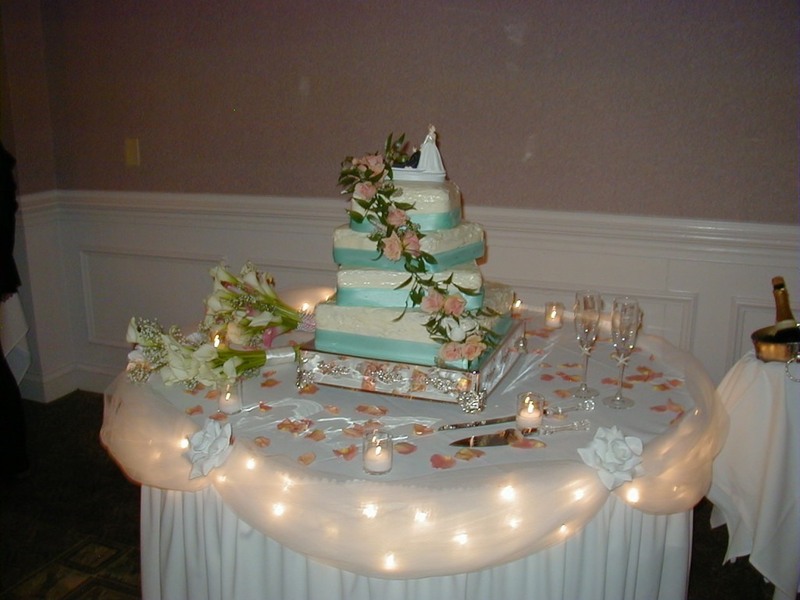 The rose petals were used on the tables at the rehearsal dinner and the cake table at the wedding. Everyone remarked on how beautiful they were and the color was perfect. They were a great decorative touch on the tables. Once the package was opened, the petals softened up and looked lovely scattered about. Everyone saved some for keepsakes. Q:What colors come in the love blend? A:The love blend comes with a mix of ivory, burgundy and pink petals. Q:My wedding will be a destination one and we will have a couple days before using the petals in the ceremony. should we keep them refrigerated until the day of? Do they come in an airtight bag? A:The petals arrive in airtight bags and are good for up to a year. You can store them in refrigerator or a cool dry place until you're ready to use them. The easiest way to soften the petals is to place them in a bathroom while taking a shower. While they will not become as soft as a fresh petal, they will absorb the steam and become softer and more pliable. This can also brighten the color of darker petals. The longer the freeze dried rose petals are exposed to the moisture, the softer they will get. If the humidity in the air is normal or high, this procedure can be done within a few days before the event to achieve your desired effect. If the air is dry, the petals may not soften or will quickly dry out again. Q:How many cups do I need to place around 18 lantern centerpieces? A:Each cup contains 20-25 petals. Depending on how much coverage you want around the lanterns, we would recommend 1-2 cups per centerpiece. Q:I am traveling for my wedding... Once at my destination, wedding will not be for another 4 days. Will these flowers hold up? A:Yes. Petals do not go bad, but may alter in color over time and air exposure; please enter a desired delivery date of up to 2 weeks prior to your event to ensure optimal condition of this item upon delivery. Q:How many cups of petals does it take to fill 70 cones? A:It is hard to say - A light fill or a very full fill? 1/3 to 1/2 cup I might say. Q:How do you make these soft before the big day? I have read that it is possibly to make them look softer. Do they still look real since they are freeze dried? A:The easiest way to soften the petals is to place them in a bathroom while taking a shower. While they will not become as soft as a fresh petal, they will absorb the steam and become softer and more pliable. A:Thanks for the suggestion! We have updated the product page to include color examples. Q:What colors are in the fall blend? A:Darker fall mix of colors such as Burgundy, Red, Sunburst, Candycorn, Pumpkin, and Yellow are in the fall blend. Q:the freeze dried petals really do not stain? the restraunt we are using does not allow colored petals unless artificial, since they stain the white carpet. A:Freeze-dried rose petals have had the moisture removed and are much less likely to stain clothing or floor coverings than fresh petals. Many venues will not allow decorating with fresh petals due to staining of carpets and table linen making freeze dried petals a great alternative. Q:What is the difference between the tropical blend and fall blend? They look very similar to me. And what colors make up the spring blend? A:The tropical blend has pink, where as the fall blend has orange. The spring blend is made up of pink, lavender, ivory, orange, and yellow. Q:what color are the petals in the friendship blend? A:This is a blend of Ivory and Yellow rose petals. Q:Approximately how many petals are in a 10 cup bag? A:There are approximately 200-230 petals in each 10 cup package. Q:Are these petals dry and crumbly? Or are they still flexible/soft? A:The petals are freeze dried to be stiff. Q:I'm looking for rose petals to use in the bath. They are too pricey to buy from local florist. Will these freeze dried petals work for the bath? If so, how long can I store them? A:This item is for decorative purposes only. We do not recommend using them in the bath as they are freeze dried and will lose their luster if placed in water. Q:How far in advance can I order these for my wedding. Do they need to be kept special (fridge/freezer) until the big day? A:We ask for a delivery date because these should be used within 2 weeks of the delivery date. You can order them as far in advance as you would like. They should be stored in a cool, dark place. They do not need refrigerated as they are not frozen. They were freeze-dried, meaning they no longer have moisture. Petals do not go bad, but may alter in color over time and air exposure; please enter a desired delivery date of up to 2 weeks prior to your event to ensure optimal condition of this item upon delivery. This is a special order item. Keep your wedding day details looking fresh and fabulous with these freeze dried rose petals. Each freeze dried flower petal is plucked from a premium rose at its peak freshness. The result? Frozen flower petals that can look fresher than those you picked from your garden this morning! Wedding flower petals come in a variety of single colors and specialty color blends. Please note that since this is a natural product, colors may vary slightly. Unlike fresh petals, freeze-dried petals will not wilt or stain clothing. Perfect for decorating a wedding aisle or tossing after the ceremony—indoors or out. Package in our sheer organza bags or favor cones to give as wedding favors or bridal shower favors. Petals are sold in the following package sizes: 10 cups, 20 cups and 60 cups. For flower toss, please allot 0.5 cup of petals per guest. 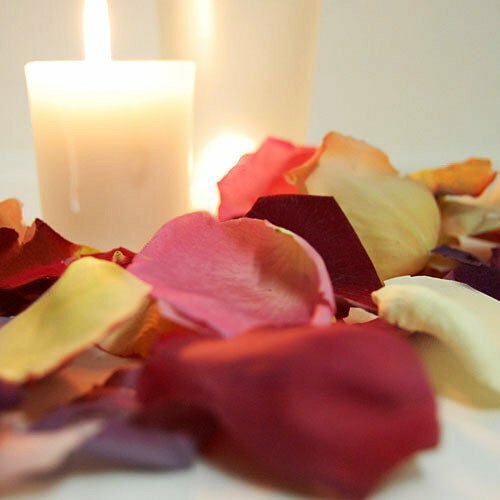 Our freeze dried rose petals are natural and environmentally friendly. They are produced in a facility that is fully powered by wind and hydro generated electricity.